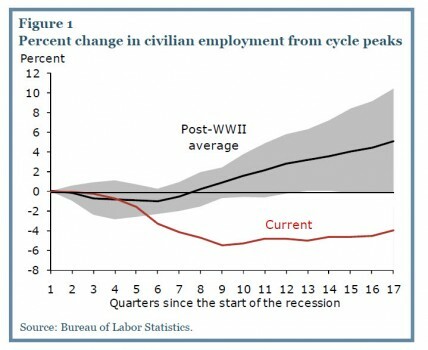 Why still no robust employment recovery? 3. Relatively more generous unemployment benefits offer no immediate incentives for job seeking, keeping a non-negligible proportion of population out of labor force. WSJ research reveals that the largest U.S.-based multinational companies added jobs much faster than other U.S. employers in the past two years, but nearly three-fourths of those jobs were overseas. Between 2009 and 2011, these multinational firms boosted their employment at home by 3.1%, or 113,000 jobs, the same rate of increase as the nation’s other employers. But they also added more than 333,000 jobs in their far-flung—and faster-growing— foreign operations. 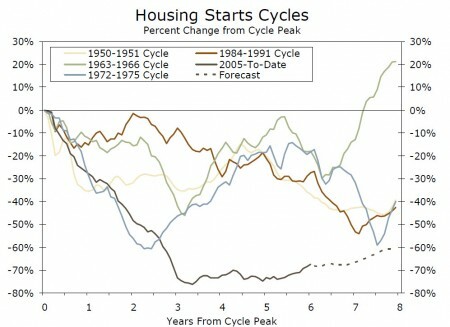 March 18, 2012 / 2 Comments on What is dragging economic recovery? What’s wrong with America’s job engine? What’s holding back small businesses? 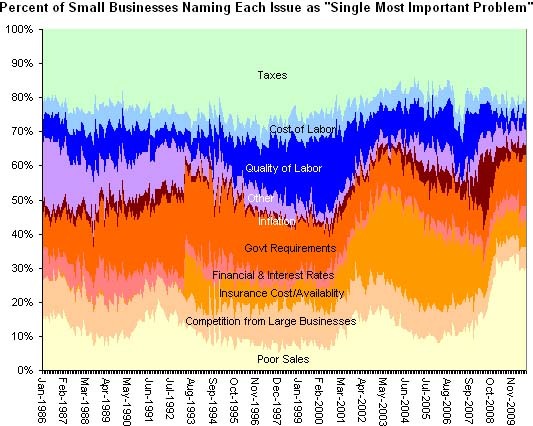 Besides weak demand as shown up in poor sales, uncertainties in tax issues and government regulations are small business’ biggest concerns. Allan Meltzer: We don’t need more excess reserves! Allan Meltzer, author of several books on the history of US Federal Reserve, said with over 1 trillion $ excess reserves sitting on bank’s balance sheet, it would be stupid to add another 1 trillion dollars. More monetary easing won’t be effective, the key is to remove the uncertainties in the economy so businesses can start investing again. Too much cash held by corporations, too little investment. Is America in paradigm shift? August 20, 2010 / 1 Comment on Is America in paradigm shift? Long recession, high unemployment. 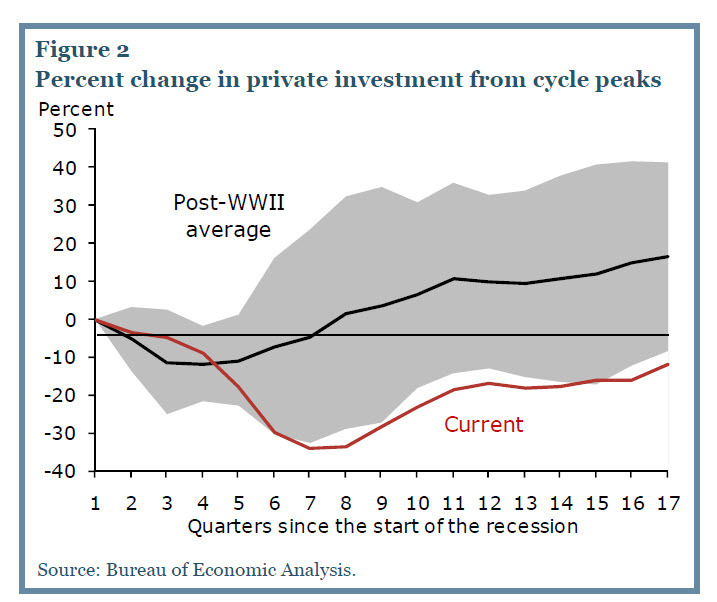 Will the long ailing economy eat away American optimism? 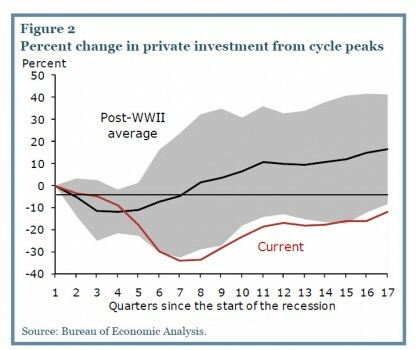 Almost 3 years into recession (technically, the recession may have ended in summer of 2009), the current recovery looks much dimmer than previous ones (see details in the following article). In 1970s, there was also a lot of pessimism. Back then, the problem was high inflation and high unemployment, or the so-called “stagflation”. Now, we are facing a much worse scenario, the threat of deflation combined with high unemployment. 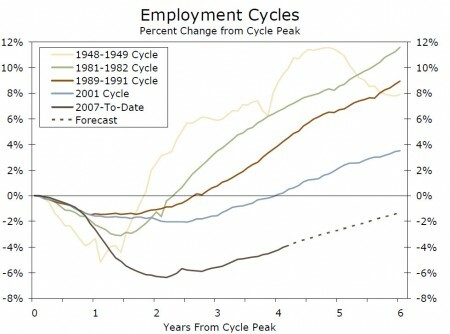 With current employment trend, we will probably still be stuck with 9% unemployment rate by the mid of the next year. People started to feel the dent psychologically, and this pessimism is so easy to spread, believe me. Our brief national encounter with optimism is now well and truly over. 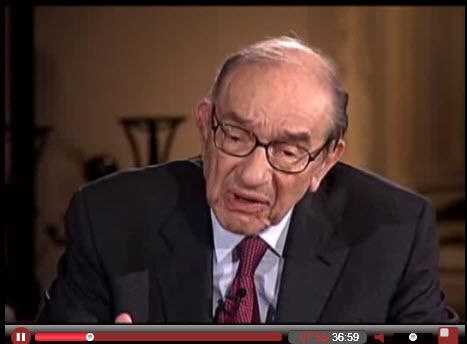 We have had the greatest fiscal and monetary stimulus in modern times. We have had a whole series of programs to pay people to buy cars, purchase homes, pay off their mortgages, weatherize their homes, and install solar paneling on their roofs. 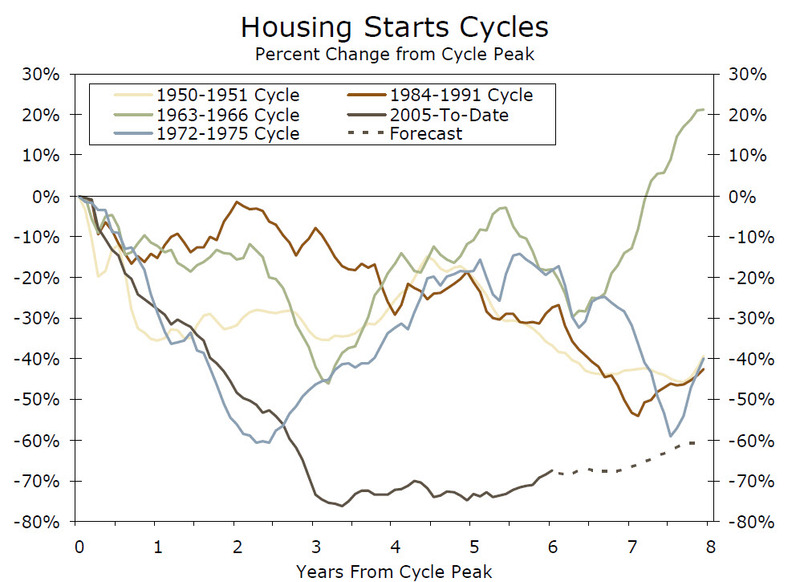 Yet the recovery remains feeble and the aftershocks of the post-bubble credit collapse are ongoing. Are we at the end of the post-World War II period of growth? Tons of money have been shoveled in to rescue reckless banks and fill the huge hole in the economy, but nothing is working the way it normally had in all our previous crises. Rather, we are in what a number of economists are referring to as the “new normal.” This is a much slower-growing economy that, recent surveys have revealed, is causing many Americans to distance themselves from the long-held assumption that their children will have it better than they. What was thought to be normal in the context of post-World War II recoveries? One is that four quarters into the recovery, real GDP would expand at an annual rate over 6%. We are coming out of the current recession at a 2.4% growth rate. We did enjoy a GDP boost from a buildup of inventories anticipating a recovery at normal speed, but it didn’t happen. David Rosenberg, chief economist of Gluskin Sheff, regards it as “frightening” that whereas the “normal” rate of increase in final sales is 4% annually, this time sales have averaged only 1.2%, the weakest revival in recorded history. At this point after the onset of a recession, employment payrolls have typically exceeded 700,000 jobs above the previous peak. 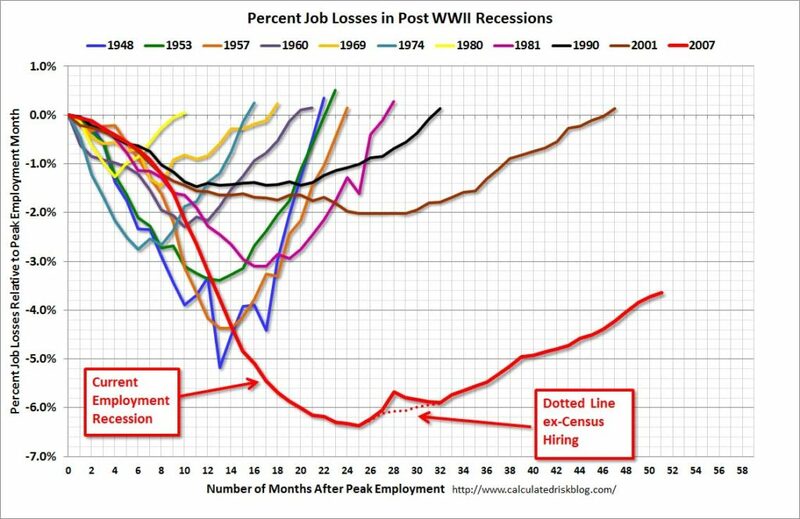 In this recession, we are still down roughly eight million jobs from the December 2007 peak. As for consumer confidence, the Conference Board survey shows an average a full 20 points below the average lows of previous recessions. There seems to be a structural change in the American economy. The relationship of household debt to income has proven unsustainable. The ratio is normally established somewhere below 100%, but in 2007 the debt ratio hit 131% of income. It has now fallen to 122%, but at this pace it would take another five years to bring it under 100%. The pre-bubble norm was 70%. To get to this ratio again, debt would have to be reduced by about $6 trillion. In the meantime, we may well be looking at a vicious cycle of defaults that in turn would produce credit tightening and still more economic weakness—compounding the caution among borrowers, lenders and public financial authorities. The most obvious source of distress right now is lack of payroll growth, and it’s likely to get worse. Real unemployment today is well above the headline number of 9.5%. That number held steady only because 1,115,000 people gave up hope of finding work and left the labor force in the last three months. Otherwise the headline unemployment rate would have been around 10.4%. Now there are at least 14.5 million Americans still searching for work: 1.4 million of them have been jobless for more than 99 weeks, 6.5 million have been jobless for over 27 weeks. 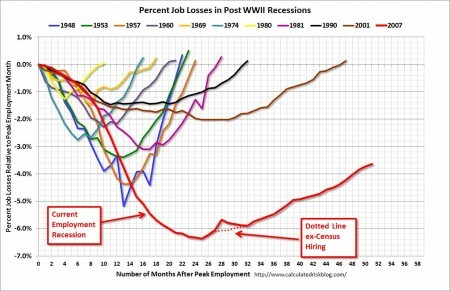 This is a stunning reflection of the longer-term unemployment we are coping with. 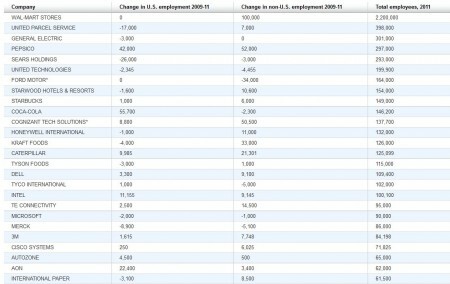 The Obama administration projects the unemployment rate will drop to 8.7% by the end of next year and 6.8% by 2013. That is totally unrealistic. It means we would have to add nearly 300,000 jobs a month over the next three years. At the rate we’re going, it will take anywhere from six to nine years to climb out of this hole. 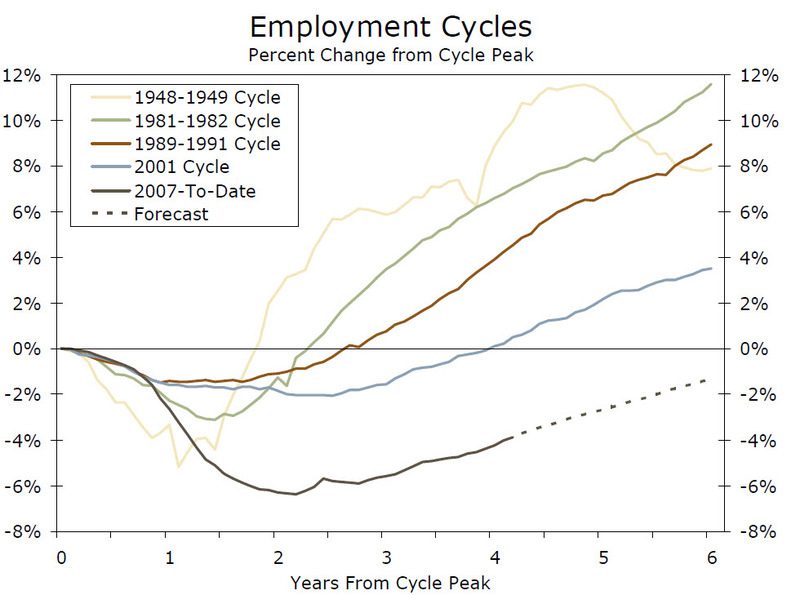 The labor market may be improving, but the pace is glacial. If there is one great policy failure of this recession, it’s that we have not used the crisis to introduce structural reforms. For example, we have a gross mismatch of available skills and demonstrable needs. Businesses struggle to find the skills and talents that are needed to compete in this new world. Millions drawing the dole to sit around should be in training for the jobs of the future that require higher educational skills. Given that nearly eight in 10 new jobs, according to the administration, will require work-force training or higher education, it furthermore makes no sense that we have reversed the traditional American policy of welcoming skilled immigrants and integrating them into our economy. Because of a recrudescent nativism, we send home thousands upon thousands of foreign students who have gotten masters and doctoral degrees in the hard sciences at American universities. These are people who create jobs, not displace them. The incorporation of immigrants used to be one of the core competencies of our economy. It’s time to return to that successful model. Higher education is another critical issue. As President Obama pointed out last week in his speech at the University of Texas, we have fallen from first to 12th in college graduation rates for young adults. The unemployment rate for those who have never gone to college is almost double what it is for those who have. Education may be the key economic issue of our time, Mr. Obama said in his speech, for “countries that out-educate us today . . . will out-compete us tomorrow.” To improve our performance will involve massive increases in scholarship support for higher education, and an increase in H-1B visas for foreign students who get M.A.s and Ph.D.s in the hard sciences. But if the economic scene these days is daunting, the political scene is downright depressing. We have a paralyzed system. Neither the Democrats nor the Republicans seem able to find common ground to address what is clearly going to be an ongoing employment crisis. Finding that common ground is a job opportunity for real leaders. Now let’s watch this interview of PIMCO’s El-Erian, the pioneer of the fancy phrase “New Normal”. Update 1. David Rosenberg WSJ interview, in which Rosenberg explains his position of why the risk of US economy faltering is quite high, and what’s the best solution to revitalize the economy (this is a very informative piece, will be very useful for the macro-type). So, if America is in a paradigm shift, what does this mean for China? In the past couple of months, I have been traveling in China, talking with fellow economists. There seemed to be a consensus that this recession is also the historical dividing line on China’s economic development path – China is also in a paradigm shift, moving away from a heavily export-oriented economy to a more consumption-domestic oriented economy.